For the tenth consecutive year, the South High PTSA has worked with the Fine Arts faculty and Library staff to transform the entire facility into an art gallery. Special thanks go to Betsy Delurigo, who coordinated this year's show, along with her team of volunteers that included Marisela Smith, Karen Duane, Tiffany Morris, Michele Nadeau, Fran Clegg, Vesna Dean, Debbie Edmonds and Sandy Yee. This year's show featured works from Ms. Stephanie Perez (Art & Ceramics), Mr. Aaron Saldana (Ceramics), Mr. Patrick Shea (Photography), Ms. Rebecca Salazar (Fine Arts), Mrs. Julie Wood (Web Design & TV Production), and Mrs. Laurie Lehmer's class. Entries from the District's Vision of Unity and the PTA Reflections programs were also on display. Art display can be found on "Library Site" on the shs.tusd.org website. Thank you to our student photographer Jason Lee who provided photos of the art display. Congratulations to all students who participated. The arts—and the National PTA Reflections program support student success and serve as a valuable tool for building strong partnerships in your school community. 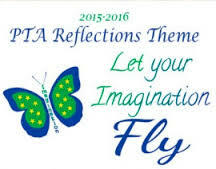 The theme for the 2015-2016 school year is Let Your Imagination Fly. This theme created by Rachel Sperry of Northwood, N.D. was selected through the Reflections Theme Search Contest. When asked what inspired her theme, Rachel said, "I tell myself to let my imagination fly when writing and sketching." The theme helps Rachel to explore her imagination and she hopes it will inspire others to be creative.